Done correctly, your retargeting strategy can deliver an incredible ROI. Ever go to Facebook and see an ad in your newsfeed from a website you recently visited? That is a retargeting ad. A Facebook ad targeting recent visitors to Allbirds.com. This wasn't by accident. Allbirds purposely targeted us because we had just visited their site. They hoped their ad would encourage us to come back and convert (since our initial visit to their website did not). Retargeting (sometimes called “remarketing”) gives you the power to show ads to people who have already been to your site or used your app. 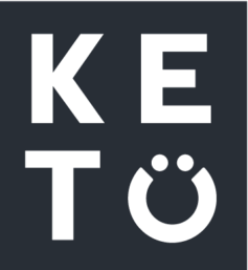 It's often used to reach out to past visitors to your website who did not convert (as was the case with Allbirds and us). But you can get even more specific. By placing ad channel “pixels” (more on this later) into your site, you can create ads personalized to the exact actions they took on your site to funnel them back toward conversion. They could show another set of ads to people who just visited their homepage that said “Hey! Check out this razor!” And so forth. In our Allbirds example above, Allbirds' messaging to us (someone who visited their homepage and bounced) was: Give our shoes a shot for 30 days risk-free. They assumed we might have left because we were worried that the shoes wouldn’t fit or we wouldn’t like them—so they doubled down on their 30-day risk-free offer. Retargeting is a powerful way to follow your users/visitors across the web, regardless of how they got to your site in the first place. For example, you can create an ad on Quora that funnels visitors to a landing page. If someone visits that landing page but does not convert, you can then show them a retargeting ad on Quora, or LinkedIn, Facebook, or Google—or on millions of sites and apps on Google’s display network. Facebook, Quora, Google Ads, or any ad channel knows who visited your site (and what they did) when you set up their “pixel” (aka “tag”) on your website. A pixel is a piece of code you install into your site that sends a message to Facebook (for example) every time someone performs an action on your site: visits a page, clicks a button, or any other behavior you can track through code. The pixel will do this regardless of whether the person came from that ad channel or not—allowing you to retarget people regardless of how they got to your site. For any event besides a page view, however, you will have to add additional code for each event you want to track. Retargeting is useful once you have over 1,000 people visiting your site a month — it can boost revenue up to 20% at a low cost of acquiring a customer. It’s almost always worth setting up the first time you test an ad channel. Bring them in with “prospecting” campaigns, and bring them back with retargeting campaigns. Retargeting is particularly useful for e-commerce brands that have a lot of different products. You can set up different retargeting ads specific to the category or product someone visited or added to cart. For example, if you're a uniform apparel company with products for medical professionals and construction workers, you’d set up separate retargeting for each. Retargeting is an effective strategy for every step of the buying funnel — including after conversion. That's because retargeting helps marketers know, with greater certainty, where a user is in the buying funnel. Pixels take the guesswork out of what your customers are thinking — their actions, captured by pixels, tell you. For example, the first time someone comes to your website, they're in the awareness stage. Use retargeting ads that highlight your logo and name to help build awareness. People who have visited a product page are likely in the interest or evaluation stage. Retarget to them with ads specific to the product they visited and ads that answer any potential lingering questions or objections about that product. People who have visited your checkout page, but did not convert, are in the decision stage. Something kept them from pulling the trigger. Show these folks ads with special promotions or an exclusive discount. People who have converted can be shown ads highlighting similar products to the one they purchased—or to remind them to order again if it’s applicable. Post conversion, retargeting ads can increase retention, cross-sell other products/services, foster referrals, and so on. The easy approach to retargeting is to apply existing marketing strategies and hope for the best. Retargeting is unique. It requires a dedicated strategy including the design of your ads, the creation of landing pages, and continuous optimization. You don't, for example, want to oversaturate any audience to the point of annoyance with your ads. Retargeting ads are often more effective when they're quirky or personal. That's because your brand is likely fresh on the minds of your audience. Retargeting lets you leverage that familiarity. Unconventional copy and design can be extremely effective with retargeting ads. It's unconventional, sure. But it's that unconventionality that grabs attention. 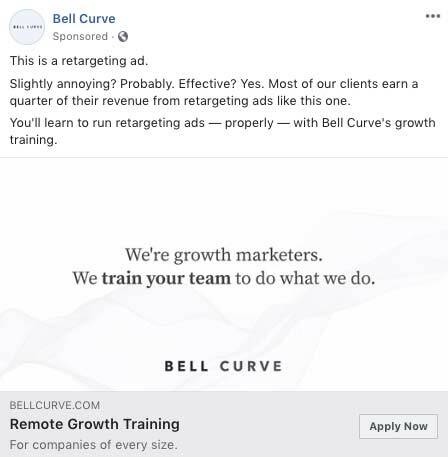 We target this ad to people who have already visited our growth training course — no need to introduce them to a product they’ve already been exposed to. Retargeting is a chance to foster a relationship with your audience beyond the heavy marketing pitch most ads are prone to. It's easy to get excited about the prospect of retargeting. So much so that you increase your budget, which increases your visibility, to see what happens. What typically happens is your audiences get annoyed. No one wants to be followed around the internet by a brand. That's why the most impactful retargeting ads appear to the same audience roughly 10 to 13 times over a period of 30 days. So, over 60 days, show that ad to your audiences roughly 20 to 26 times, and so on. As we mentioned earlier, retargeting requires a dedicated strategy. It's also important to note that the most effective retargeting ads run for a considerable amount of time. The longer your ad runs, the larger your audience grows. For example, you have 1,000 web visitors when you start your retargeting campaign, but over three months you'll have even more visitors, thus more people viewing your ads. Plus, our experience tells us running a retargeting ad for at least three months yields better returns than an ad that runs for just one month. The longer your ads run, the more likely your brand will work its way into your audience's mindset, making conversion even easier. The key, again, is to keep your brand front of mind without becoming that annoying company that stalks its prospects.